It was hot summer day when the sun scorched every object that came in direct contact under his blazing rays. On that particular day the temperature shot up by another few degrees making already miserable hot day even more difficult to bear! People looked up at the sky eagerly looking for the sign of rain to bring the temperature down to bearable degrees, but all they could see by squinting eyes was the sun god shining bright with his full glory, blissfully unaware of the complaints that were thrown at him from one part of the world below him! Amidst all the complaining people, the girl wearing white salwar kameez breezed through the crowd. There was only one thing that was going in her teenage mind as she quickly walked through the street lined with shops and complaining people. She knew where she wanted to go, away from curious glances and gossiping tongues, to meet her beloved who was waiting for her with bated breath. Once she reached the planned meeting point, she quickly glanced around to make sure no one was around without stopping as her eagerness to meet her beloved shadowed her usually alert mind. Luck was on her side as the orchard where they planned to meet was deserted and even the bright sunrays found it difficult to stream through thick canopy of trees. She quickened her pace, thinking how their meeting will culminate after a year of separation! Yes… It was a painful separation for a year and it was not the very first time in their life that they were separated from one another! They have been separated from one another for many years as long as they could remember. It was written in their destiny and these two lovers were destined to meet only in the scorching hot months of summer as even the Gods were envy of the kind of pure love they shared! Even when the universe conspired to keep them separated for most part of the year, the lovers didn’t stop loving each others as they waited with bated breath in anticipation of the short few months of their time together. The girl in white smiled a tender smile when she looked around for her beloved and found him no where in sight! He was teasing her by playing the game of hide and seek, which made the anticipation a bitter sweet thing! She looked around the grounds, behind the wild berry bushes and fruit trees but he was still not to be found anywhere! The tender smile on her face slowly gave away to frustration, and then anger at her beloved who refused to grow up and enjoyed this childish game since the time they were small kids. She looked for him at their favourite spots and the secret meeting places which nobody knew! Seconds lead to minutes and the anger was slowly replaced by worry! Soon the worry lines appeared on her otherwise smooth face and the pouted angry lips turned downward with immense cloud of sadness engulfing her! She didn’t want to think the worse, yet! She was hopeful that her beloved would visit her that day and she didn’t want to go back home with disappointment etched high on her eyes, as she did for the last one month! He had promised her that he will come visit her as soon as the summer months began, but for some reason he failed to keep his promise this year! It was very unlike him to not to keep the promise he made to her! Although her mind said it was time to leave, her heart told a different tale and that moment she chose her heart over her mind! She walked and walked, now looking up, until she found him smiling down at her! He was there…. 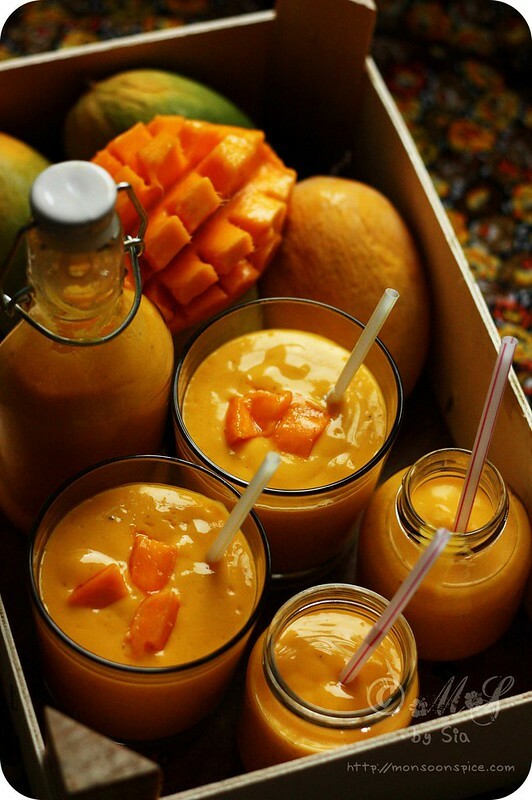 Mango Lassi ~ To welcome the king of fruits! He had indeed arrived! Oh, the teaser! She ran towards him not bothering to pick up the white silk scarf around her neck that slowly slipped to the dusty ground. She ran until she became breathless and her heart began to pound fast and hard! She ran until her legs began to protest and bead of sweat formed on her forehead! But she ran until she held her object of desire in her hands and bit him hard! One bite and the sweet memory of her falling in love with him flashed in her mind! It was a love at first bite… Her beloved was here and she was over the moon with happiness! 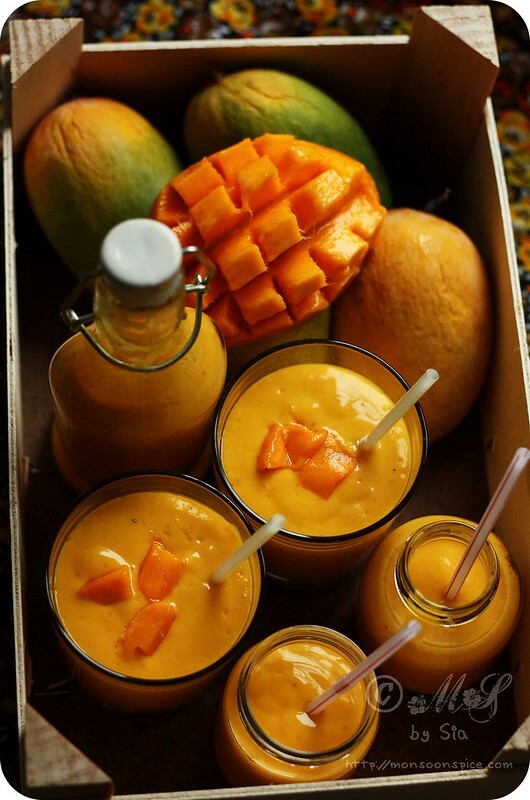 Her beloved king had arrived, king of fruits; golden, sweet and juicy Mango! 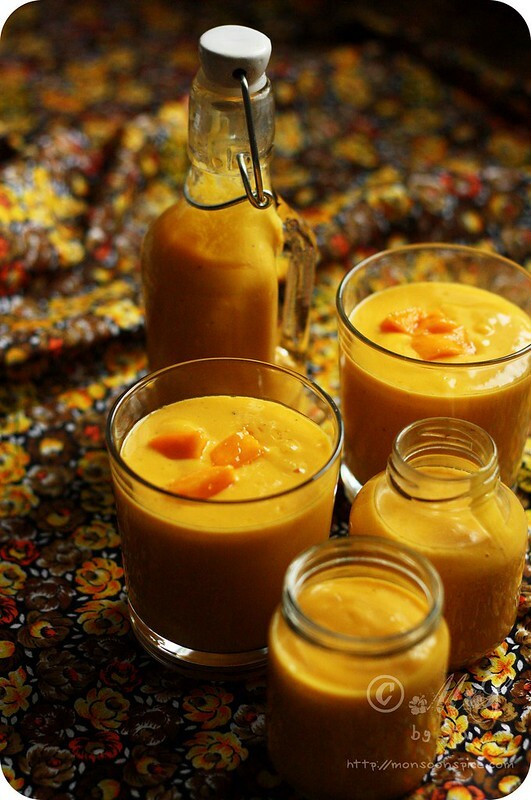 Whenever I make Mango Lassi at home, I use just 4 ingredients – mangoes, yogurt, sweetener and an aromatic spice to enhance the flavour. I prefer using Indian Kesar or Alphanso mangoes during mango seasons and canned mango puree when mangoes are not easily available. For sweetening I use jaggery, which is an Indian unrefined cane sugar, most the times or granulated or caster sugar. 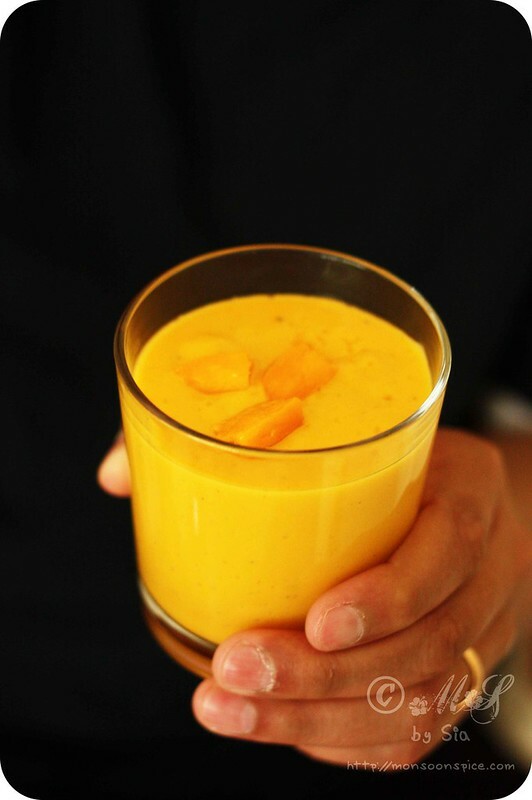 To enhance the flavour of this delicious sip Mango Lassi, I alternately use either saffron or green crushed cardamoms but never together as I prefer distinct flavour of individual spices to the combined, confused flavour of two different and strong spices! Below are just few guidelines for ingredients used in making Mango Lassi as it would be quite comical to call it a recipe. More because Mango Lassi doesn’t really need a recipe as it is just blitzing together all the ingredients and you really needn’t stick to the exact quantities of the ingredients listed below. 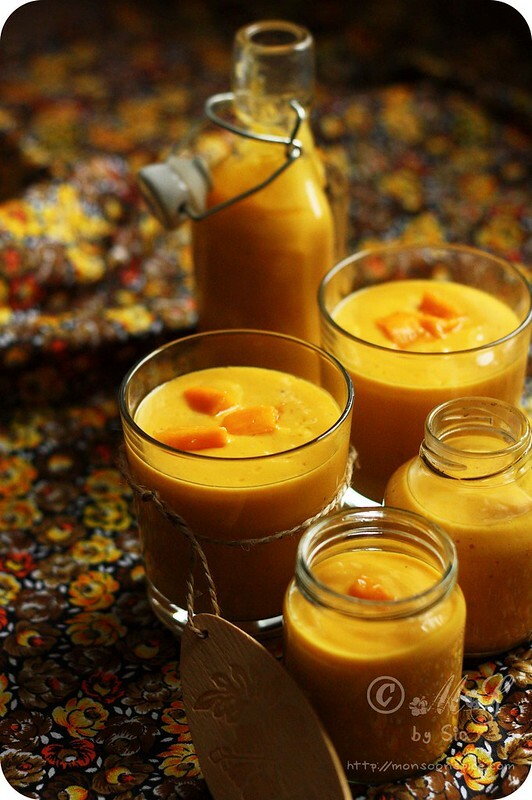 Feel free to adjust the quantities of ingredients needed for making Mango Lassi to your liking and taste. I have written down few points at the end of recipe, suggesting substitutes for the ingredients listed in the recipe as well as the ingredients to suit vegan diet. Feel free to change it to suit your taste buds. But do remember to drink it chilled and enjoy the very last drop of this thick, creamy goodness! Sweet and juicy Mangoes ~ The king has arrived! 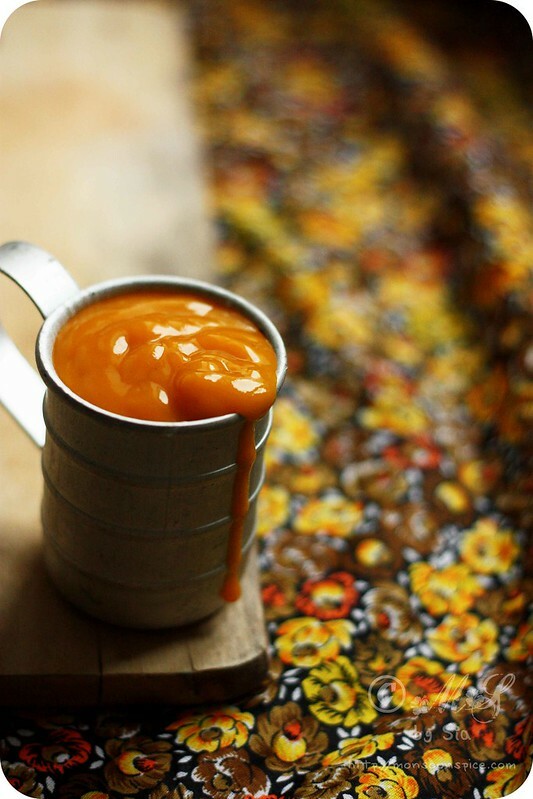 Sweet mango puree ~ Heavenly nectar! 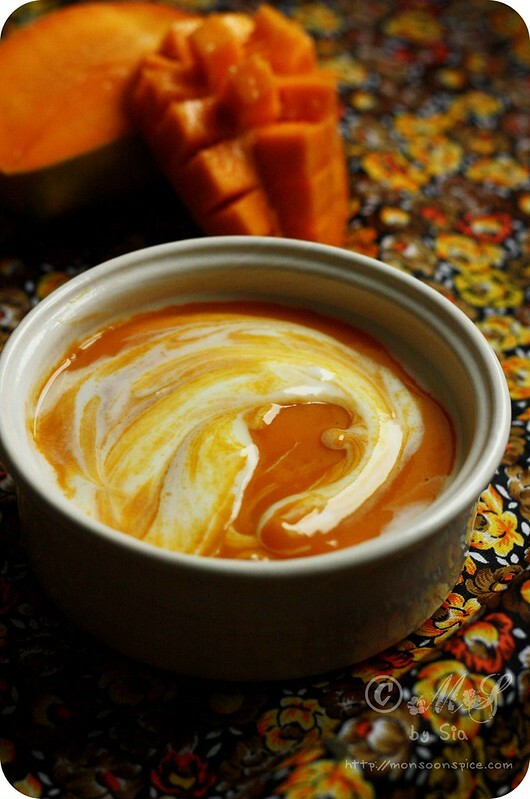 Mango and yogurt ~ Sweet beginnings! 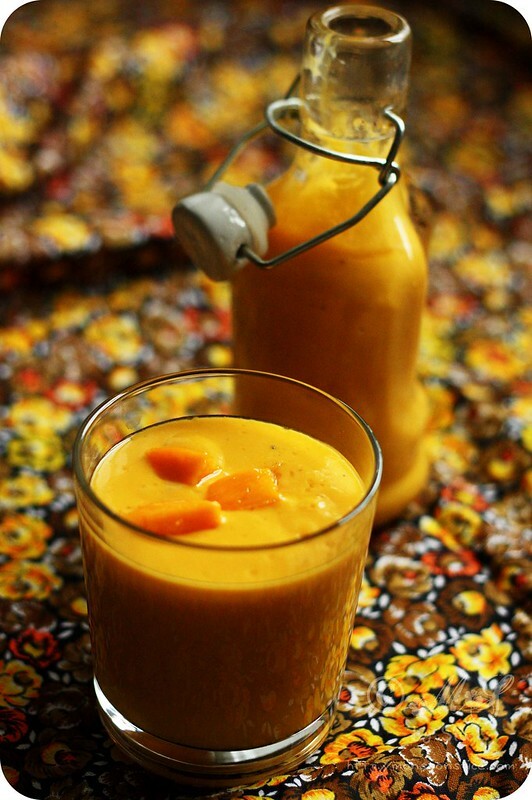 Mango Lassi ~ Flavourful affair! 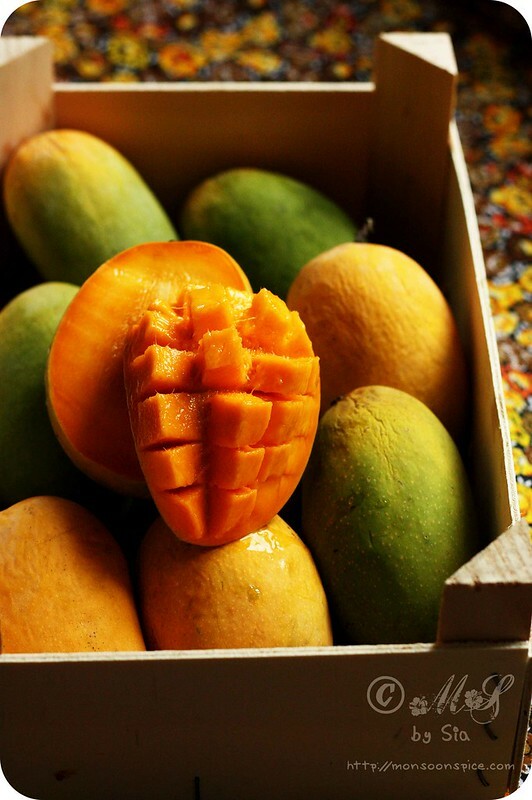 Peel the mangoes with a help of a sharp knife or peeler. Chop the pulp into large chunks and place them in a blender or food processor. Once all the pulp and juice is removed, discard the stone. Blitz the mango pieces to smooth paste without adding any water. 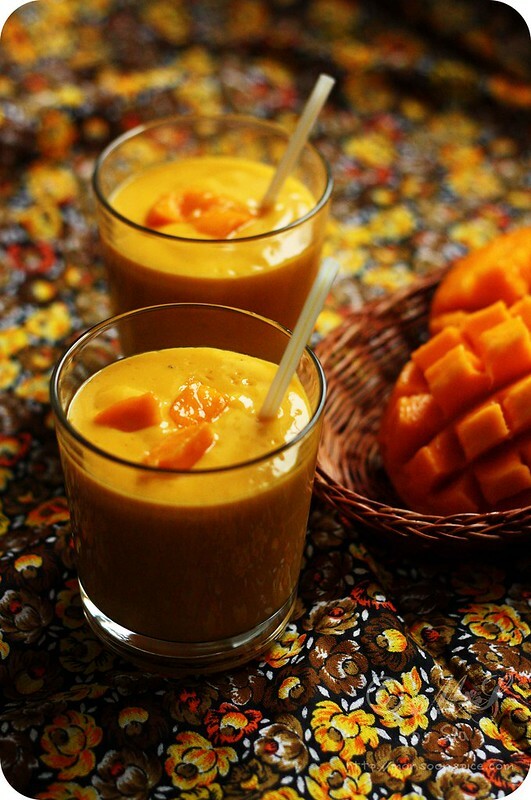 Once the mangoes are pureed, add yogurt, sugar and cardamom powder to the blender and blend them all well for 2 minutes. 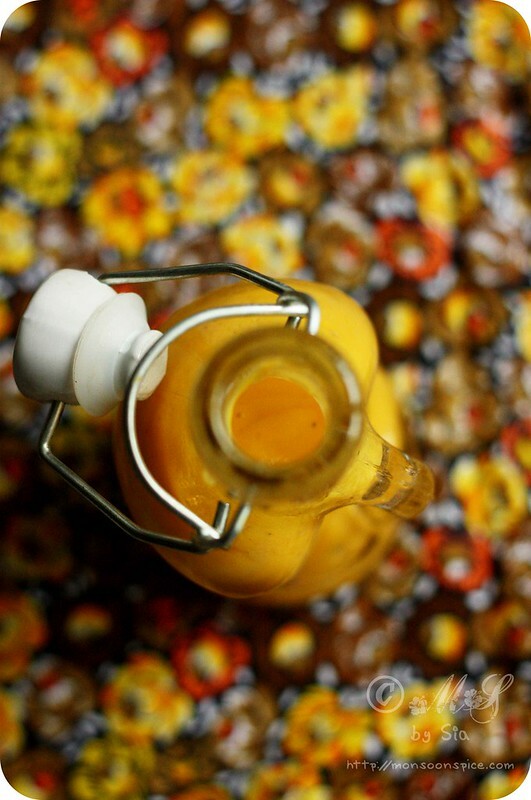 Chill the Mango Lassi in a refrigerator before serving. Take a sip and relax! Bliss! 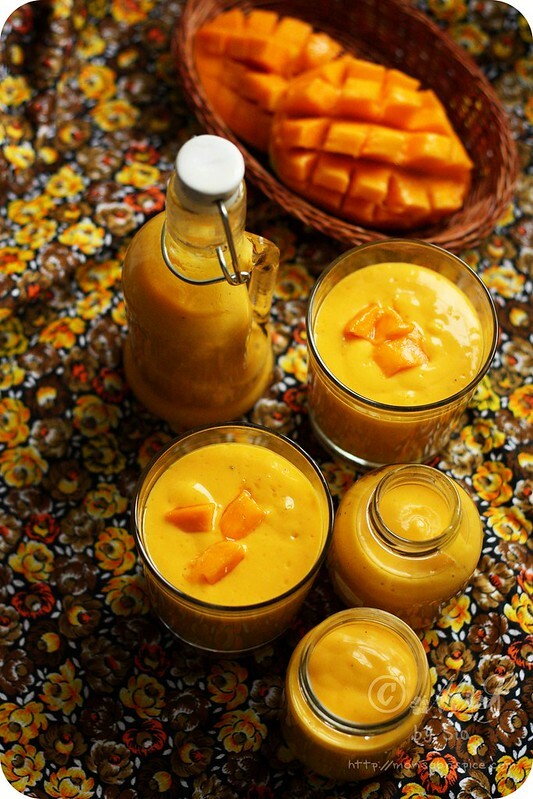 Indian mangoes like Alphanso and Kesar works best for this recipe. But in case you don’t get either of them, use any ripe, sweet mangoes. 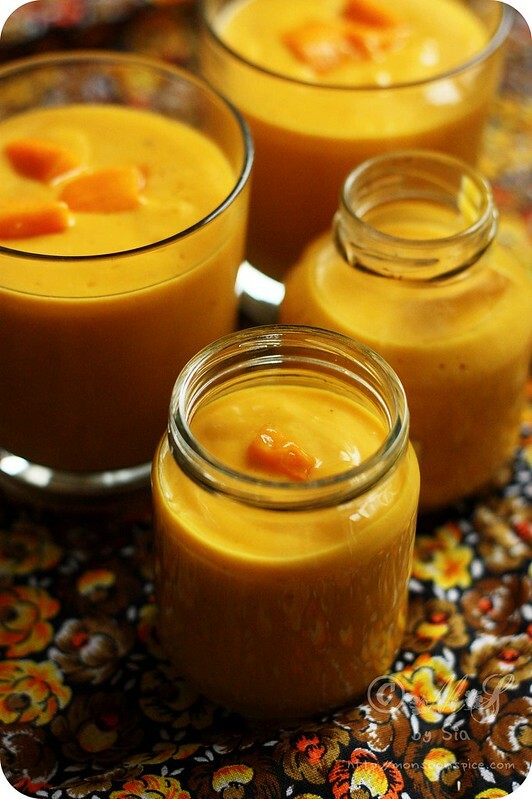 Alternatively you can also use 1½ - 2 cups of canned mango puree available at most supermarkets and it tastes equally good. 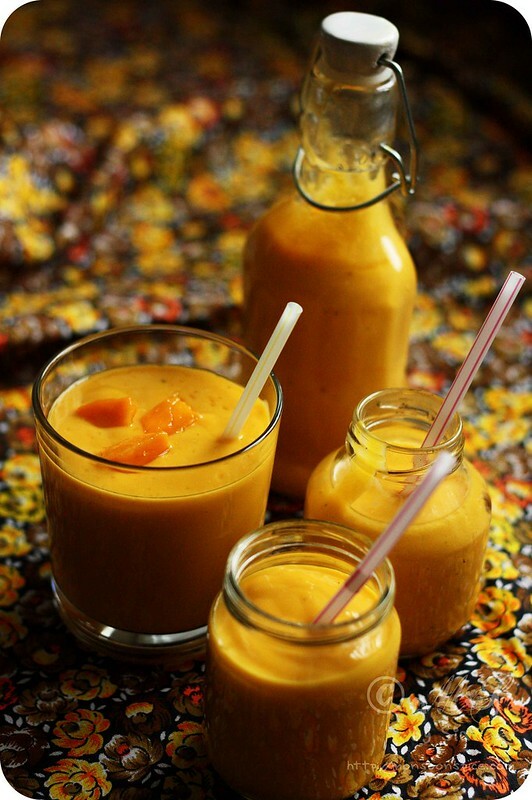 If you find the consistency of Mango Lassi to be too thick and creamy to your liking, add ½-1 cups of chilled water or crushed ice or milk and blend them well. Use regular granulated sugar or caster sugar as per taste. Alternatively you can also use jaggery (unrefined cane sugar) or brown sugar or Demerara sugar or honey as a sweetener. If you are not too fond of sweet stuffs, you can entirely omit adding any sweeteners. 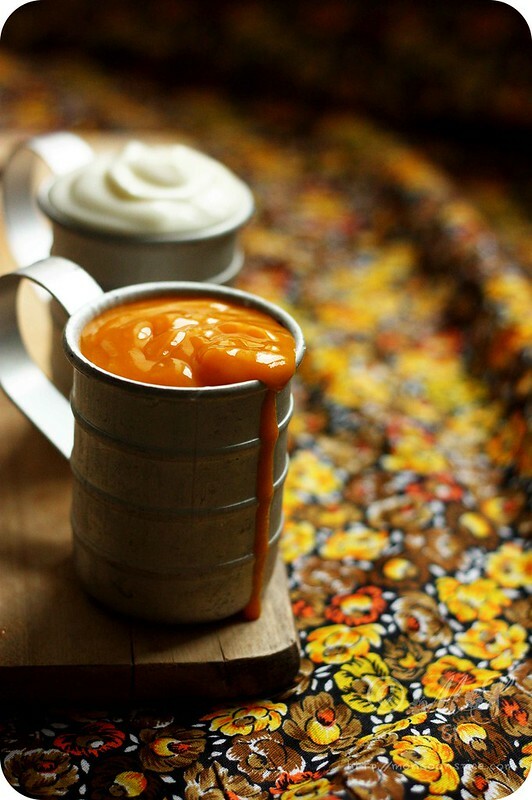 You can use a generous pinch of saffron dissolved in a tbsp of warm milk in place of cardamom for another aromatic and heady flavour! I alternately use either saffron or green crushed cardamoms but never together as I prefer distinct flavour of individual spices to the combined, confused flavour of two different and strong spices! 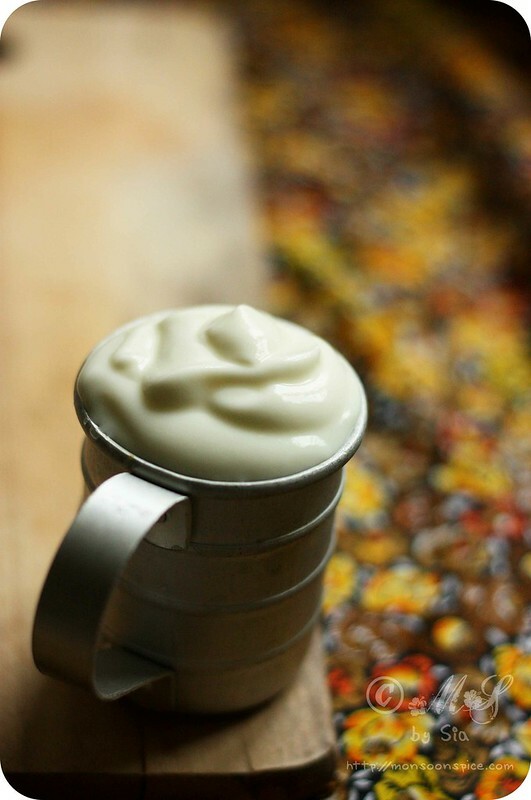 Vegans can replace yogurt with cashew/soya yogurt or silken tofu or with coconut milk and still enjoy the goodness of Mango Lassi to heart’s content! Mmmhhh, divine! That is such a wonderful lassi. Your pictures are so beautiful. I'm so inspired to try all your recipes and the ones I tried so far came out so good. Thanks for doing such a fabulous job! 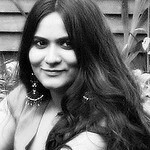 @mymusings, happy to know that you liked it so much :) thanks for leaving such a positive feedback! I'm so glad I found this recipe! I have a couple of mangoes to use (immediately) and I was trying to remember a drink that I used to enjoy years ago with a friend. And here it is!